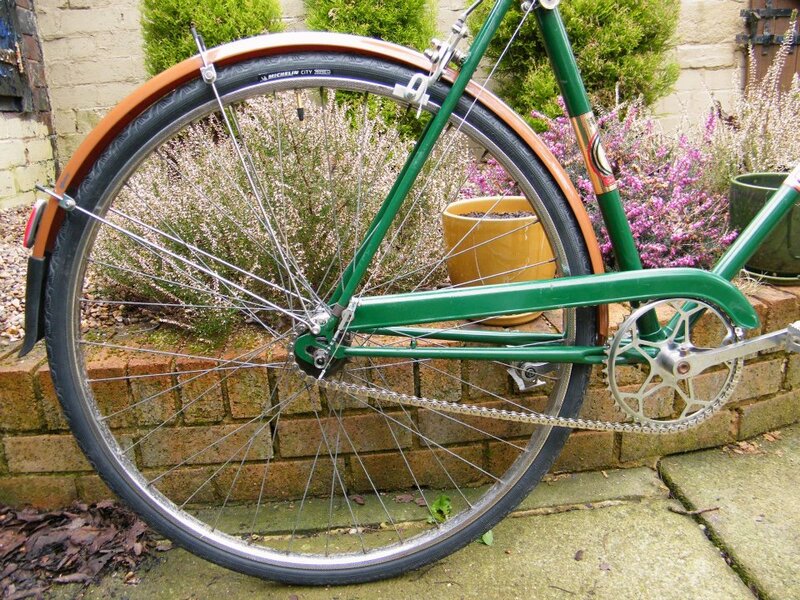 This is my 3rd vintage bike build and something of a departure from my usual style; normally, I go for the low slung, aggressive whip in and out of traffic type but this frame is crying out for something a little more serene. 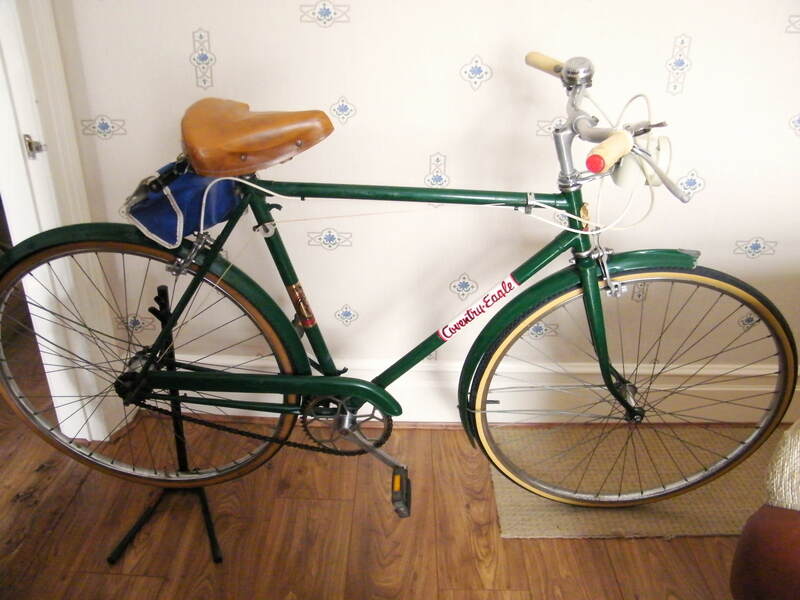 It is, of course, a beautiful Coventry Eagle from the 1960s but I don’t know the exact year. I got it from a guy who was selling it for an old fellow who’d been riding it for years (possibly from new) but has gotten too old for it. As a result, it’s in incredible condition; there are a few scrapes and scratches here and there, the springs in the saddle are shot and there’s a little bit of surface rust bubbling up here and there but hey, it’s 50 years old! So, I’ve already scored a vintage 100mm long negative rise Sturmey Archer stem on eBay for a few quid which will be cradling a posh new set of Soma 3 Speed moustache bars which I bagged for an unbelievable £22 from the good people at Keep Pedalling, Manchester. I’m yet to settle on just how I’m going to mount the brake levers and, indeed, which brake levers I’ll be using but it’s fair to assume I won’t be mounting standard aero road levers on the front like so many people do; that just looks… wrong. 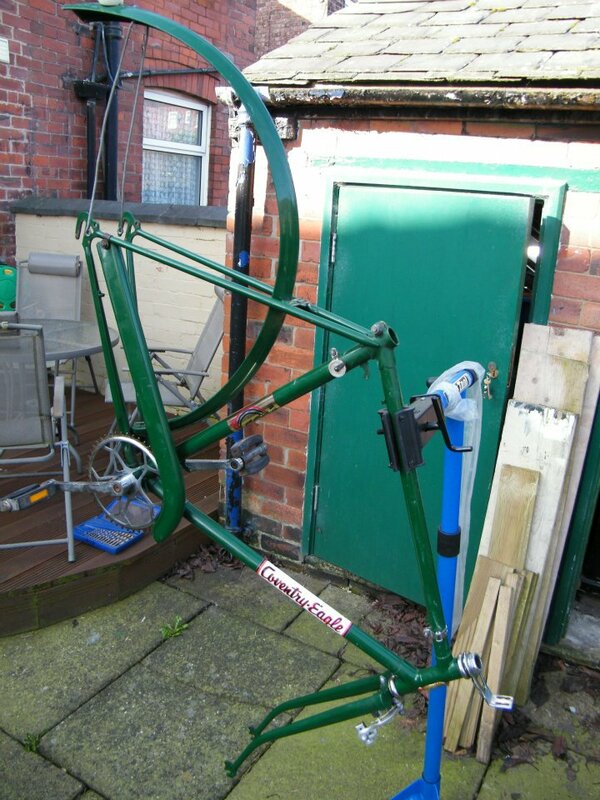 For now, I know it’s going to be more of a sit up and beg type affair than I’d normally go for, but it’s still going to be a modern twist on the old English steel classic; check back soon for another progress report! OK, so a little while later and I’ve made some progress. Although the bike could probably have been ridden in the state I bought it, I wanted to make sure everything underneath was in as good a condition as the exterior appeared so I put it in my Park Tool workstand (which I adore, by the way) and stripped it right back. This uncovered a few problems, but nothing I wasn’t expecting anyway; the headset and bottom bracket bearings needed replacing and one of the bolts securing the rear mudguard had rusted solid so I needed to (carefully) drill that out without damaging the frame or mudguard. By this stage, I’d already decided to replace the old steel mudgaurds with a modern set I had lying around as I was keen to try out green and brown as a colour scheme. 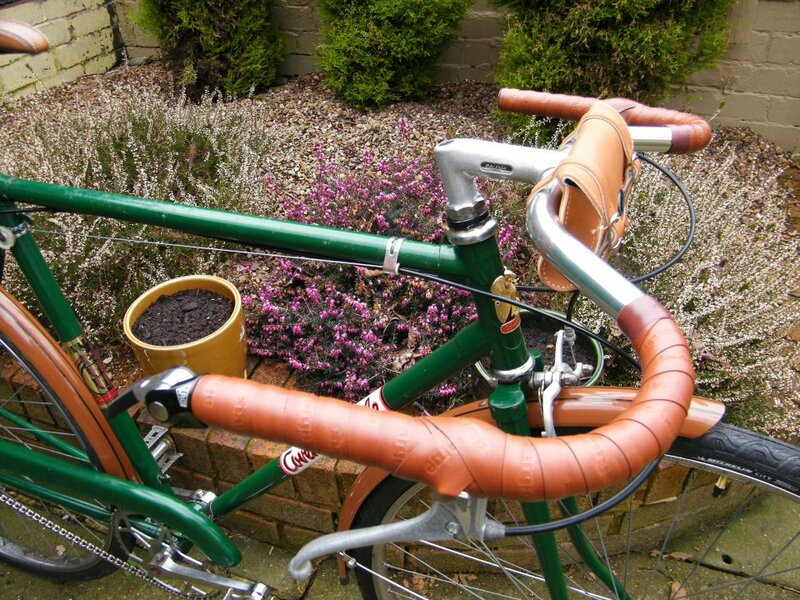 Here’s the first test fit of the new mudguards and I have to say I’m really loving how the green & brown work together. 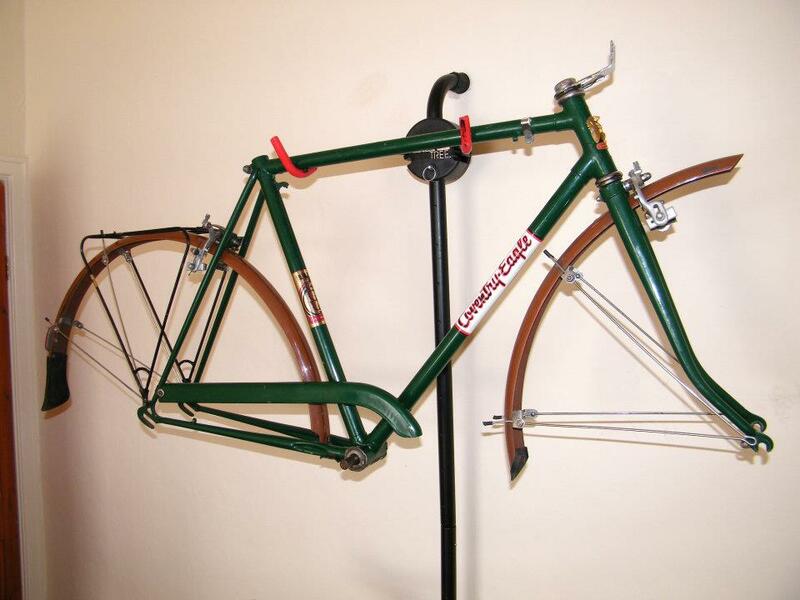 At this point, I was also toying with the idea of fitting a vintage pannier rack but it later got removed because I think it was spoiling the overall look. From here, it was a case of ordering lots and lots of new parts, taking the wheels into the bike shop to have the hubs checked over and the rims professionally trued and then a couple of days assembly. OK, so here we after the final assembly; and, my god, isn’t she pretty? Hubs given the all clear, rims trued, new Velox cloth rim tape applied and brand new Presta valve tubes filling Michelin City tyres, I’m really pleased with the look. 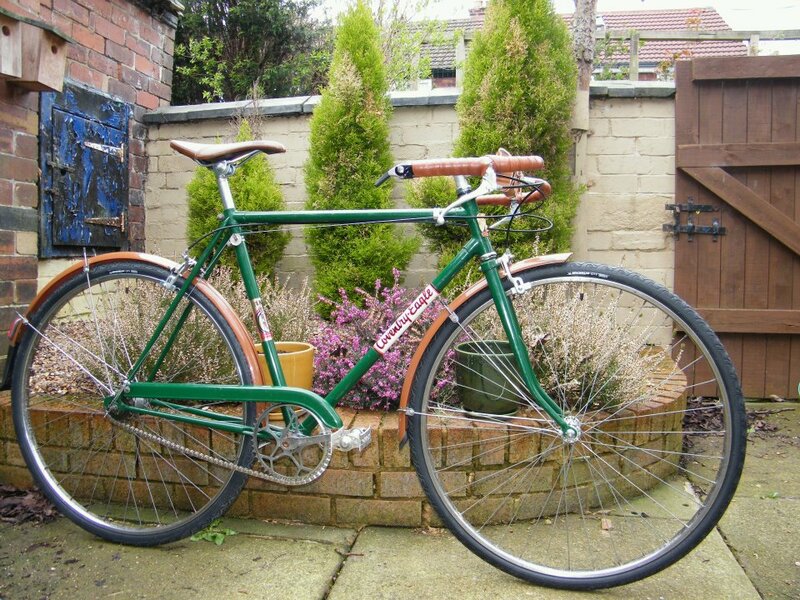 Originally, the bike would’ve had amber wall tyres but that would’ve been one colour too many, in my opinion. The original steel chainguard looks great with the modern and uber cool half link chain; this one happens to be a Diamondback one designed primarily for BMXs but it’s exactly the same as the legendary Gusset Slink half link chain in every way except for the price so if you’re not bothered about a multitude of colours, I’d recommend you buy this one and save yourself a few quid! This is a set of Soma 3 Speed II moustache bars which (I’m told) are exactly the same as the hideously expensive Nitto equivalent; I must say I agonised over whether they’d work at all with this bike but now I have them fitted, I can’t imagine anything else on there! 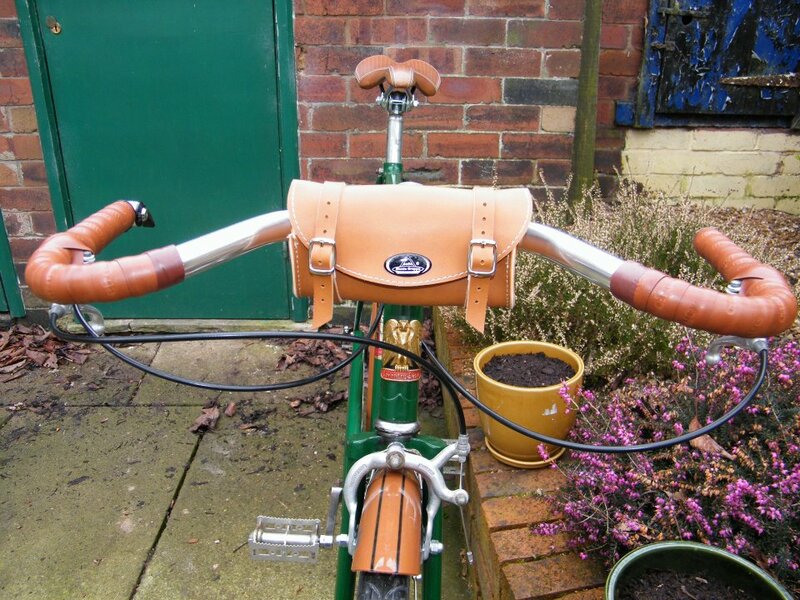 The handlebar bag is handmade from real leather by a small company called Selle Monte Grappa; I think it finishes off the front end beautifully and it’s just big enough for a spare tube, your keys and mobile phone. What more do you really need to carry anyway? Slowing down is taken care of by the original Weinmann type 730 calipers and I saved the brake levers too; mounting them underneath the bars where they should be. 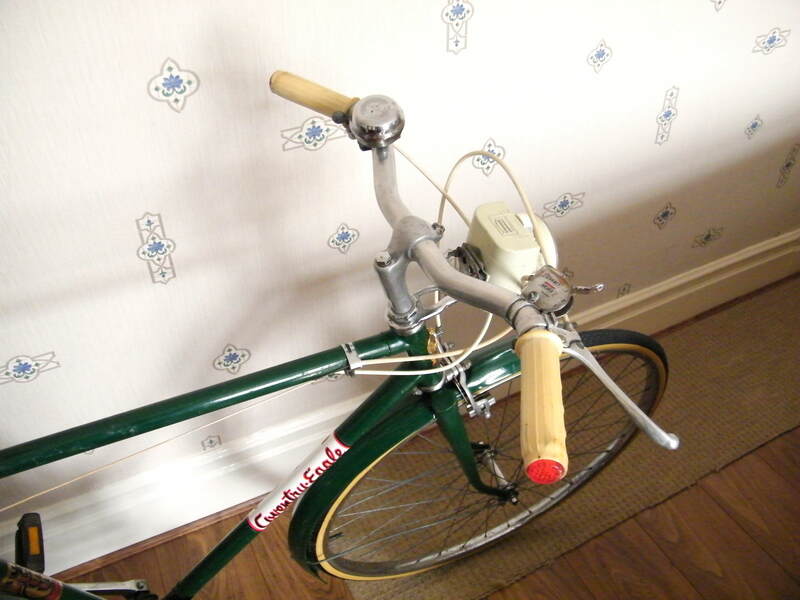 Google “moustache bars” and you’ll see lots of people fitting modern aero levers sideways on the front of the bars which, in my humble opinion, is just plain wrong. The wrapping of the brown Charge U-Bend bar tape got a little tricky by the brake levers but with a little criss-cross, I think I’ve managed to nail it. Notice the brown electrical tape finishing it all off too; attention to detail matters, you know. Shifting through all 3 (count ’em, 3) gears comes courtesy of Sturmey Archer’s fabulous indexed bar end shifter; I’ve fitted the other side with a chrome style bar end plug to keep everything neat. And so, here she is, all finished off and ready for pootling duties around the Northern Quarter of Manchester or wherever else you may choose to take her! Great job, looks the goods!!! Thanks! I’m reluctant to sell it though. But hey, I guess you can’t keep them all.